After repeated attempts of removal and growing controversy, the Zuma Presidency has now come to an end. The allegations of corruption and the ongoing criminal investigations, have eroded the base within his own political party. The ceaseless chaos within the ruling African National Congress (ANC), has seriously impacted the financial stability and economy of South Africa. On the 13th of February, the national executive committee of the ANC, announced it had recalled President Zuma. This had occurred after the President had ignored senior leadership, to resign the week before. The underwhelming response Zuma then provided, was that he planned to leave office, in about three to six months. The ANC which has dominated the political world of South Africa, since the end of apartheid in 1994, has seen its popular support crumble, in the face of continuous governmental scandal and economic mismanagement. The ANC share of the vote declined from 62% of the electorate in 2014, to 54% in local elections held in 2016. It was determined by political operatives, over the last few months, that the longer Zuma clung to power, the worse things would be for the party in the 2019 presidential elections. He was after all, term limited anyway. 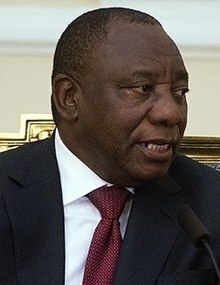 Former South African President Zuma 2009 – 2018. President Zuma came into office in 2009 and was re-elected in 2014. As the accusations against President Zuma and his cronies mounted over the years, he stubbornly refused to bring about any meaningful reforms. Regardless of the court cases that had gone against him, or the ever growing mass public demonstrations, his determination to remain in power, remained resolute. Despite the fact, that two thirds of all voters and over half of his own ANC membership, thought he should resign, mattered little to him. On the other hand, Cyril Ramaphosa who became the new leader of the ANC with a narrow vote in December, had been fleetly moving to combat the widespread corruption, that has proliferated during the tenure of President Zuma. The moment President Zuma lost control of the ANC, his days became numbered. The South African parliament picks the president and since 1994, the ANC has dominated the legislature. Ramaphosa has now succeeded to the presidency, upon the forced departure of Zuma. This of course was a year ahead of the presidential elections, now scheduled for 2019. Under the influence of the ANC, the police and prosecutors, are already coming after supporters of President Zuma, as his powerful system of patronage, begins to unravel. Hours before, Zuma actually stepped down from power, investigators had raided a number of properties, belonging to the now infamous Gupta family. A total of five people were arrested,being accused of illegal activity, concerning a government funded dairy farm. Leading prosecutors have already identified, the equivalent of $4 billion USD (United States Dollar) in assets, that they claim have been accumulated through illegal activities. Their aim is to recover these assets for the government. Zuma Must Fall protests in front of the South African Parliament buildings in Cape Town. The former President faces a total of 783 charges of corruption, which he has continued to either deny or ignore. This partly explains his earlier refusal, to step down from power. The Supreme Court of Appeal had ruled last October, that the previous decision to drop the charges, was deemed to be irrational. Now out of office, Zuma is far more vulnerable to indictment, prosecution and ultimately, jail time. By the second week of February, the ANC parliamentary caucus moved for a new motion of no confidence, if Zuma reused to resign. Knowing he was about to be impeached by his own party the following day, the former President had little choice, but to resign on the 14th of February. 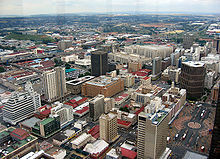 Johannesburg, the economic capital of South Africa. South Africa with a population of 55.9 million, is far worse off now, then it was a decade ago. From 2002 to 2008, the economy grew an average 4.5% yearly. Economic growth has now come to a virtual standstill. The country actually dipped into recession in 2017, even as most of the rest of the world saw growth picking up. Economic growth for 2016 was just 0.3% and last year was only 0.8%, with a rate forecast of only 1.1% for 2018. It has remained at one of the lowest levels, in sub-Saharan Africa. 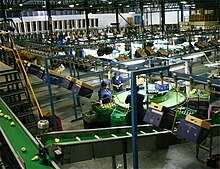 South Africa is the second largest economy on the continent, after Nigeria. It remains the most industrialized nation in Africa. The nominal GDP (Gross Domestic Product) in the country at $280.37 billion USD, has actually been stagnated for years. Unemployment has skyrocketed to an alarming 28% and comes in even higher at 36%, if one includes those who have given up the search for work. South African public debt has tripled under President Zuma’s tenure. Sovereign debt now at over 51% was downgraded to below junk status, by Western investor credit rating agencies. One more notch down by Moody’s for example, will drive South African debt, out of the benchmark indices. Poverty rates have increased under President Zuma, as economic inequality widens. Public services are in serious need of reform and increased investment. At the state owned power utility for example, electricity costs have increased five fold, over the last decade alone. A number of structural impediments to growth, as in inflexible labor markets and a workforce that lacks proper education and training, will take years to reform. Any progress in this direction during the Zuma era, had simply been derailed. The other hindrances to economic growth, which include inefficient bureaucracy, political uncertainty and extensive corruption, can be more easily reversed, with a new government in control. There is little doubt, the political corruption at the top echelons of government and society, have eroded public confidence, over the last few years. Instead of blocking judicial action against the perpetrators of these crimes, the former President is now far more likely to be compelled to answer the charges, now being leveled against his inner circle. 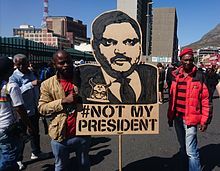 A protest placard depicting Atul Gupta at a Zuma Must Fall protest in Cape Town. The allegations against his friends, business associates of himself and his son Duduzane, are now likely to be fully investigated. The three Gupta brothers are also likely to face increased legal scrutiny, as the noose tightens around those, who improperly influenced government appointments and contracts. The most serious charge against the former president, is what prosecutors are calling state capture. That is Mr. Zuma and his friends, put state owned institutions and enterprises, into the hands of individuals that allowed them to be looted for personal gain. It has been estimated by the former, but still reputable finance minster Pravin Gordhan,that anywhere between 150 to 200 billion rand, has been stolen. That is the equivalent of $11 to $15 billion USD. Leaders of the BRICS nations at the G-20 summit in Hangzhou, China 2016. Former President Zuma is to the far right. Worse yet, a number of companies that have global operations, have also been implicated in the scheme. Some of these are domestically based, others are foreign operated and controlled. The process of state capture had been extended through law enforcement, the Revenue Service, the Treasury Department and even the Central Bank of South Africa. President Ramaphosa will not find it easy to move against this pervasive corruption, that exists not only in the top ranks of the ANC, but right down to the local level. It is prevalent in the party and throughout state institutions. He will ultimately be forced to gradually, weed out these individuals. If he were to move too fast to root out the vapid dishonesty, it would endanger not only his own power base, but the grip of the ANC on South African politics. Despite the fact that in South Africa, much of the economy is either state owned or regulated, and therefore corrupted during Zuma’s tenure, the business community had indeed courageously taken steps against questionable actions of the government. The one public institution that remained largely free of the corruption, promoted by the former President, was the judiciary. The Judicial Services Commission charged with appointing judges,has a total of 23 members, of which only four are appointed by the President. This fact alone, gives the opposition hope, that the crimes committed during the Zuma era, will finally be adjudicated. Confidence in Ramaphosa to bring about change and reform, has already had an impact outside of politics. The South African rand has risen against the American dollar, to its strongest level in almost three years. In addition, there are feelings of hope, not seen since the inauguration of President Mandela in 1994. It has not been lost on the electorate, that Mandela himself, would of preferred Ramaphosa to succeed him. Thabo Mbeki instead was elected President in 1999. Ramaphosa had not been ruthless enough it seemed, to consolidate power into his own hands. This is now working to the advantage of President Ramaphosa. Ironically, Mbeki himself, had been forced to step down early from power in 2008, when Zuma had wrested control of the ANC, away from him the previous year. It seems a political cycle, has just been repeated. For most South Africans, the end of the Zuma era, is viewed with a sense of relief. There is now hope that as the political mess is being cleaned up, the economy will rebound. Many commentators believe that as a stable government returns in South Africa, investors both domestic and foreign, will once again see the country in a more favorable light.